Would you wish get Demi Lovato’s eyebrows? Are they real or fake, how comes they evolved from being very thin to bushy in just a single season of X factor? Learn how to get demi lovato eyebrows and much more since you definitely must be wondering ‘how to do demi lovato eyebrows’ if you love thick and lush brows! 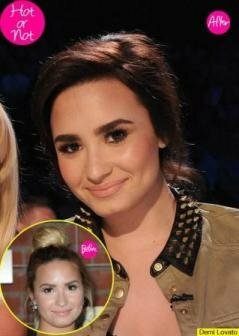 How to get Demi Lovato eyebrows? Demetria Devonne “Demi” Lovato is an American songwriter, singer, actress, and philanthropist who ones served as a mentor and a judge on the “on the American version of The X Factor.” Other than these achievements, if you looked at her face, you will notice she has super luscious, defined and very thick brows other than her brand new brunette glossy locks (anyway, she had many hair looks including bangs, long hair, blonde i.e. she dyed her hair 8 times ). If you followed season 2 X factor, you would have noticed her eyebrows did evolve and they became new center of attention. She had lush and very pronounced brows that would make you wonder if she loves Lily Collins thicker eyebrows . Love them or hate them, you definitely notice how they perfectly framed her eyes. Do You Love them? How can you Get them? The first and most important thing, that everyone who has very thin or sparse brows would ask is how to do demi lovato eyebrows . It is very simple. 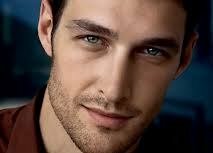 If your brows hairs are sparse , begin by filling them in using a good brow gel or powder . Although you are commonly advised to use gels or powders, one or two shades lighter than your skin tone when filling brows; you will need to go for a color that is darker than your skin tone by two shades. This will ensure they look more defined and standing. For instance, Lovato has darker and more defined eyebrows that match well with her dark hair (dyed dark), giving her sharper face features illusions! When shaping them, ensure you do not overpluck them . 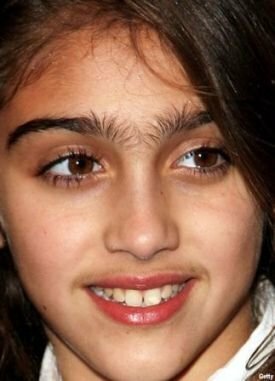 For those who find the exercise of eyebrow shaping a challenge, they should consider going for a good brow stencil that will flatter their face type i.e. 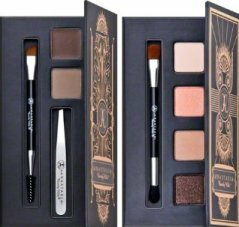 see more on best eyebrow stencils and best brow shapes for different face shapes . This is just a simple Demi Lovato Eyebrows Tutorial that can actually help. When asked in an interview, she claimed she got such brows after using Latisse which is used to make eyelashes to grow faster and longer . According to her, “It’s a miracle. It’s a product that helps your lashes grow really long. I was like, ‘Oh, this will be a good idea to make my eyebrows fill in.’ And so I used Latisse on my brows and they, like, took over my role as a judge on the X-Factor. I mean they had an opinion of their own…It was in HD, it was SO bad. I don’t know what I was thinking.” Here she actually regrets having gotten her eyebrow too big with a product that is meant for eyelashes. Not everyone thinks that Demi Lovato’s eyebrows look great. Some are happy and they really love them while others are not. For instance, some people feel that since she has a longer face, how she did them initially made her look like she is suffering from tadpole eyebrow problem that gives people severe, squinting and angry looks. According to Khesti “the beginning is too thick, and the ends are too thin” Therefore her new look with thicker eyebrows is better! Are Demi Lovato eyebrows Fake? Going by her words, the demi lovato fake eyebrows saga that some people are propelling is not true. They are real, however, she did a blunder when she used lattice that made them grow very thick . How do you know her thick eyebrows are real? Any source?